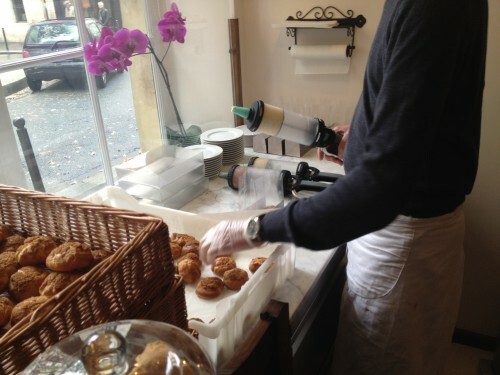 In a pretty place tucked behind the abbey of Saint-Germain, MOF Manuel Martinez is producing tender cream puffs that are filled to order. Never soggy, not too sweet, and piped with a tangy filling based on fromage blanc and flavored with vanilla (nature), coffee or chocolate. A single puff is 1.70€ (about the same price as a macaron from the nearby Ladurée), or you can buy 3 for 5€, 6 for 12€ or 12 for 18€. A few tables provide a place to sip the coffee and tea that are also for sale. 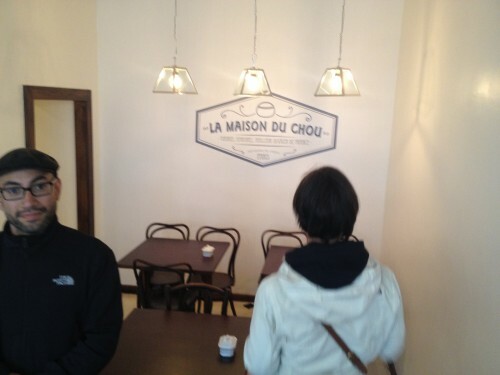 Hi, thanks for the nice comments about La Maison Du Chou.